The assertiveness & self-confidence eLearning course will give participants an understanding of what assertiveness and self-confidence each mean (in general and to them personally) and how to develop those feelings in their day-to-day lives. These skills will encompass many aspects of the participant’s lives and have a positive effect on all of them. Those who behave assertively always respect the thoughts, feelings and beliefs of other people as well as their own. Assertiveness concerns being able to express feelings, wishes, wants and desires appropriately and is an important personal and interpersonal skill. In all your interactions with other people, whether at home or at work, with employers, customers or colleagues, assertiveness can help you to express yourself in a clear, open and reasonable way, without undermining your own or others’ rights. Assertiveness enables individuals to act in their own best interests, to stand up for themselves without undue anxiety, to express honest feelings comfortably and to express personal rights without denying the rights of others. 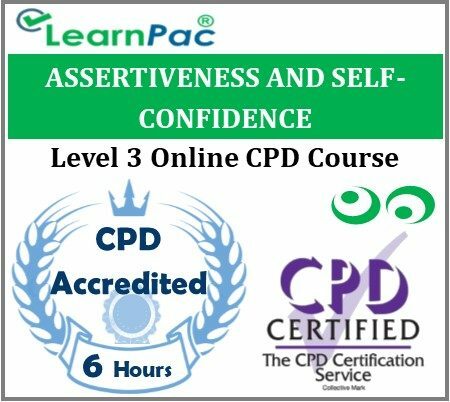 The content of this online training course has been independently certified as conforming to universally accepted Continuous Professional Development (CPD)guidelines.